Runes are the letters in a set of related alphabets used to write a number of Germanic languages before the adoption of the Latin alphabet and for specialized purposes after that. The Scandinavian variants are also known as Futhark or Fuþark (derived from the first six letters of their alphabet: F, U, Þ, A, R, and K), while the Anglo-Saxon variant is called Futhorc or Fuþorc (due to sound changes in Old English for those six letters). 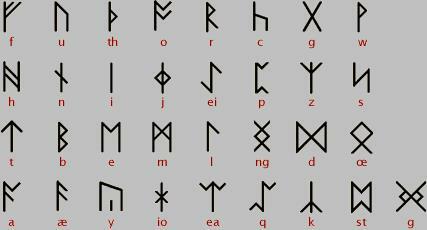 The origin of the runic alphabet, though, remains somewhat uncertain. Since the script appeared relatively late in the history of writing, it stands to reason it was derived from some earlier form. According to some researchers, the runic alphabet was developed by the Goths, a Germanic people, who took it from the Etruscan alphabet of northern Italy. Two inscriptions, the Negau and the Maria Saalerberg, bear writing using an Etruscan script in a Germanic language that date back to the 2nd and 1st centuries, respectively. These artifacts give support to the theory of an Etruscan origin. The angular shape of the runic letters may have been due, in part, to the texts having been written on hard surfaces such as rock, wood, and metal, where it was important to follow the grain. The Gothic Runes, as they are called, were used until about 500 CE when they were replaced by the Greek-based Gothic alphabet. There is additional evidence for when the runic scripts originated. First, the earliest known Futhark inscriptions were written both left-to-right and right-to-left, a process both the Greeks and the Etruscans used before the 3rd century BCE. Second, the letter “æ” and its corresponding sound disappeared from Germanic languages by the 3rd century CE, yet it continued to appear in lists of Futhark alphabetic letters after that time. Linguists have determined that Proto-Germanic, the precursor of all the later Germanic languages, used the vowel /æ/, which means the letter must have been created when there was a need for its sound. It was retained in the alphabet past its usefulness, most probably out of tradition. Third, the Proto-Germanic sound /ai/ became the sound /e/ in later Germanic languages. This means the original spellings of words must have been standardized during Proto-Germanic times; because writing systems tend to evolve conservatively, the original forms of the words were preserved even after their pronunciations had long since changed. All of these clues date Futhark’s creation to somewhere in the 1st century BCE. The Futhark of 24 letters is called “Elder Futhark” and was used mostly before the 9th century CE. But as languages changed and more Germanic groups adopted it, Futhark changed, as well, to suit the language it came to represent. The Anglo-Saxons, who spoke Old English, brought Futhark from continental Europe to England in the 5th century, modifying it into the 33-letter “Futhorc” to account for sound changes occurring in the language. Even the name “Futhorc” demonstrates a phonological change – the long vowel /a/ in Old English evolved into the later vowel /o/. As many new vowels arose in the spoken language, a lot of new vowel letters appeared in the Anglo-Saxon runic alphabet. In Scandinavia, Futhark also evolved around the 9th century, but instead of the original 24 letters, the “Younger” Futhark contained only 16 letters. Nine of the original Elder Futhark letters were dropped (g, w, æ, p, z, e, ng, d, and o), and one new letter was created (R). There were two major varieties of Younger Futhark, namely Danish and Swedish-Norwegian. The Old Nordic language underwent a number of complex phonological changes, which led to the reduction in the number of alphabetic letters. Several old, unused letters were removed, so that many of the remaining letters came to represent multiple sounds: th was used for /þ/ and /ð/; u for /u/ and /o/; k for /k/, /g/, and /ng/; i for /i/ and /e/; t for /t/ and /d/; and b for /b/ and /p/. The new letter, R, was originally used for an /er/-like sound in Old Nordic but became /y/ in later Scandinavian languages. Futhark continued to thrive as a writing system throughout the early centuries of the first millennium, but it began to decline with the spread of the Latin alphabet. Anglo-Saxon Futhorc started to give way by the about the 9th century, and it didn’t survive much past the Norman Conquest of 1066. Futhark continued to be used in Scandinavia well past that point, but by 1600 it had become essentially nothing more than a curiosity for scholars and antiquarians.